CH and I LOVE curry. I think I could eat it every day, all day. Our first experience eating curry was at a college friend’s wedding about 6 years ago. They had a traditional Afghan wedding and it was incredible – the food, the family, the dancing and just the overall joy. This was years ago, way before CH and I got married, but we both remember that wedding being our first experience enjoying the great flavours of curry. 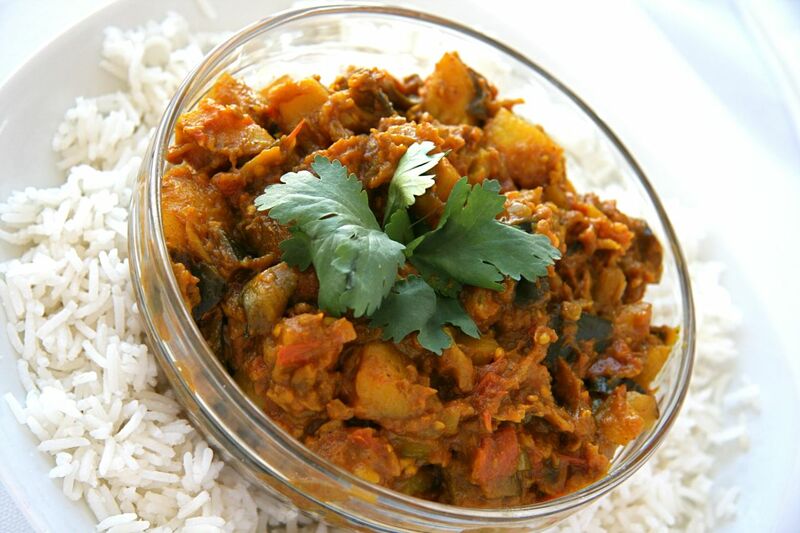 Although there are different types of curries, depending on the region of origin (Indian, Thai, Afghan etc.) we seem to enjoy Indian curries the most, specifically, Northern Indian curries. We were at the Home & Garden show in Vancouver about 5 years ago (wow time flies!) and came across Daksha’s Gourmet Spices booth. We met Daksha herself and immediately fell in love with her warmth and dedication to creating quality spices and ingredients. 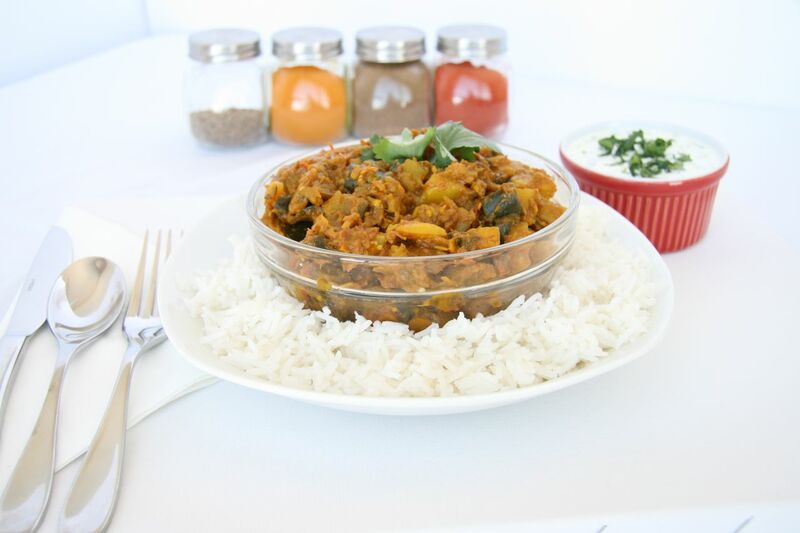 We also instantly fell in love with her curry mixes – which are pre-mixed spices that you add to your proteins or veggies and then enjoy (she offers butter chicken, chana masala, beef vindaloo etc. etc.)! I still remember our first attempt at cooking curry at home – we made butter chicken in CH’s basement suite! We were surprised how long the smell (albeit delicious!) lasted but it was worth every, single, bite! We haven’t turned back since and almost exclusively use Daksha’s spices for all of our curry cooking needs. We have moved past using her pre-mixed blends but if you are interested in trying curry for the first time, I suggest you try one as they are super easy! Make sure to check out Daksha’s website – she ships her spices directly to your home (across Canada) and also sells them in specialty stores across Canada! I can tell you that using good quality spices for your curry is essential. They make the difference, so be sure to source out good quality ingredients and you will be rewarded. This is a delicious blend of buttery eggplant and hearty potatoes. It goes great with an all Indian meal or I like to serve it as a base to a simply grilled piece of fish, topped with a cilantro yogurt sauce or raita. It is also a great vegan/vegetarian meal too! This recipe is about a 5/10 on the heat scale, so if you like spice you can kick-up the heat by adding additional green chillies or red chili powder. Heat olive oil in a large sauté pan over medium heat. Add cumin seeds and onion and cook for about 5 minutes – until onions are slightly browned. Add in ginger, garlic, green chillie, thana jeero, garam masala, turmeric powder, red chillie powder and salt. Stir well and allow spices to cook for 2 minutes. Add in the potatoes and eggplant and mix well to incorporate spices and evenly coat all veggies with the spice mixture. Allow to mixture to cook covered on low heat for 20 minutes, stirring occasionally. Add diced tomato (or tomato sauce) to the mixture and re-cover. Continue to simmer for another 20 minutes or until the veggies are cooked. Sprinkle with fresh cilantro just before serving, if you wish! This can be prepared ahead of time and kept warm until the rest of dinner is ready, or until you are ready! Serve with rice, naan, raita or eat it all by itself (it won’t last long)! It is truly a healthy and filling meal! Also, feel free to be creative and add in other veggies too! 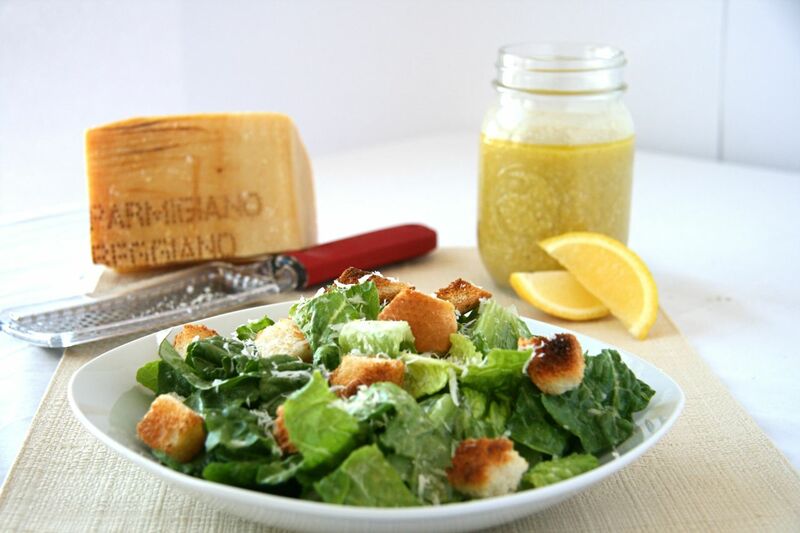 Caesar salad has always been a favourite of mine and my Mom is known for her caesar salad. In fact, it pretty much goes without saying that if my Mom brings anything to family gatherings, it’ll be “her” caesar salad. It’s really delicious and I love it. But, there is a problem. CH hates mayonnaise – like really, really detests it. He wouldn’t eat my Mom’s salad and claimed to hate all caesar salads because of this. Point blank – no discussions, he wouldn’t eat it and I hated going through the effort of making my Mom’s dressing for just me. Thus, I decided to de-construct my Mom’s recipe and make it CH approved. The first thing I did was remove the mayo, and I didn’t like the idea of raw eggs either, so those were gone too. Anchovies aren’t worth the effort (in my opinion) and this is how I reached my recipe below! It is my creation and I’ve never enjoyed caesar salad more (sorry Mom!). But the ultimate test was CH….I tricked him (I know, I am a bad wife!) and told him it was a vinaigrette. He LOVED it. Asked for seconds, loved it. Then, he looked at me….said it tasted like caesar salad, and I told him it was! I made my own recipe so that he’d like it and now he does! Yeay for cooking success! Be aware, there is a good amount of garlic so you might want to brush your teeth afterward! Or, do what I do, and make your husband/partner/friend eat it too, then they won’t notice! Or, reduce the garlic to your liking! It is a heart smart and lightened version of a classic. I hope it makes its way onto your table soon! In a small bowl, whisk together the olive oil, vinegar, mustard, garlic and Worcester until well combined and smooth. Add in the lemon juice and S&P. Whisk well again. Add in the milk and parmesan, whisk again until thoroughly combined. 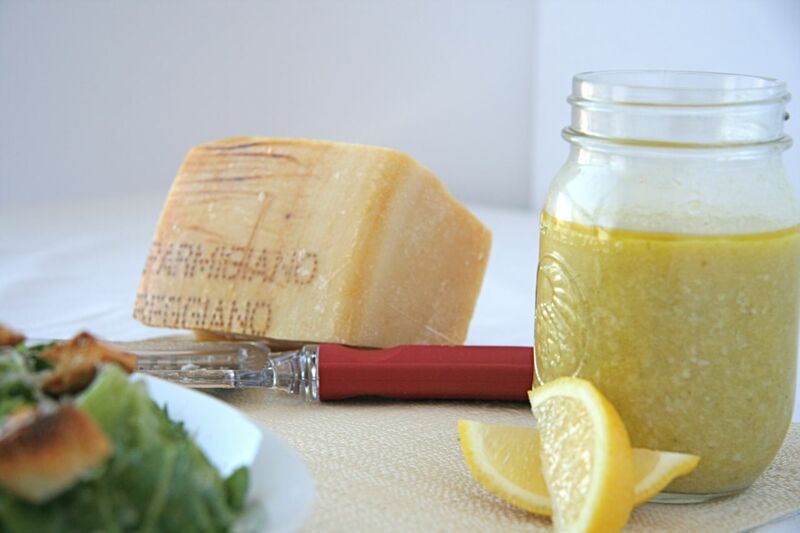 Pour the dressing over your lettuce mixture of choice and top with fresh parmesan. Enjoy! *PS – This dressing also goes really well over spinach with mushroom and bacon! My first blog post is an interesting one and what sums it up best is my husband’s, CH’s, comment: “Why is your first blog post about baking….you don’t bake, you cook”. Let me explain! I am a tried and true cook and don’t get me wrong, I do bake, but it seems that I bake the same recipes, over and over. I find baking a bit tedious and precise and this is a problem because I am definitely an “add another clove of garlic” or “a bit more wine won’t hurt” kind of cook, so sometimes baking and I don’t always turn out well (ok…well, more often than not!). BUT…that’s about to change. One of the reasons my blog was created was because I was truly inspired by a group of wonderful and talented cooks/bakers over at WC. They are truly an inspirational bunch and their creations, especially in the baking category, are incredible. 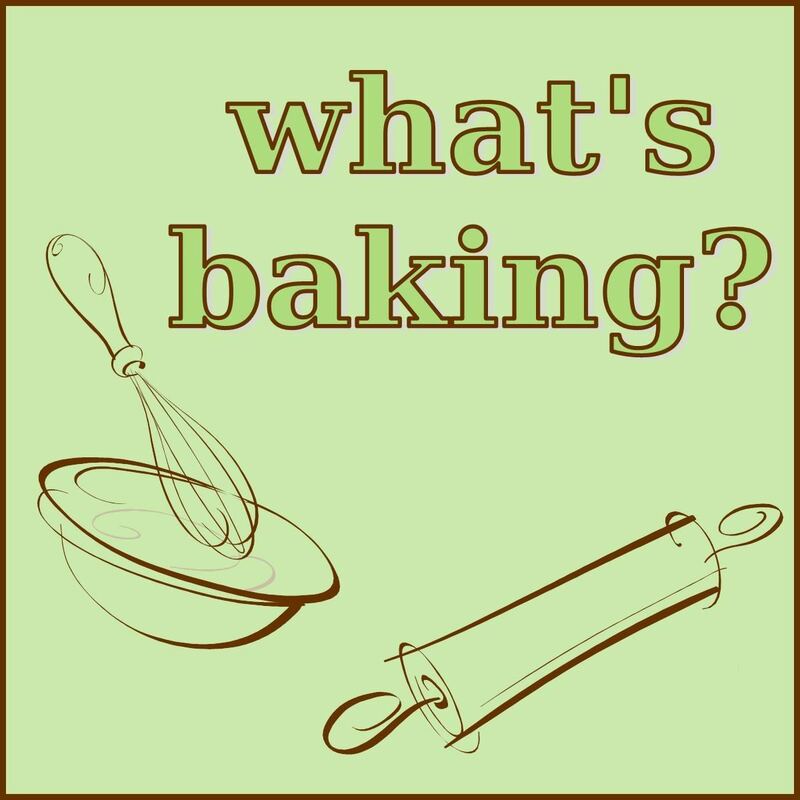 So, when I was finally set to launch my blog, I decided to join their “What’s Baking” group to improve my baking skills, once and for all. I figured, if I was obligated to bake a new recipe once a month, I would have to get better at baking (right?)! This month, Dunne’ over at With a Cherry On Top, is the host blogger. The theme she chose for February is “Baked with Love”. I’ve had many ideas, gone back and forth, but because this is my FIRST ever post, I decided to make it truly special and bake one of my Mémère’s (see About JBean for who this is and why she is important) recipes – Coconut Drop Cookies. As I’ve mentioned, my Mémère has passed away, but these cookies still remind me of her and are very special in our family. My Mémère used to make these cookies by the ice-cream bucket but they never lasted long! In our family, they were referred to as “Mémère’s Cookies”. Just the smell of them reminds me of baking with her (but it can be concluded that I didn’t get her baking genes!). My brother played junior hockey and lived away from home – which I know was difficult (and not just for him!). My Mémère used to make him an ice-cream bucket of these cookies and send them to him, just so he could have a taste of home, and he was definitely the biggest fan of these cookies! I made a batch of these cookies with one of my friends over the holidays to surprise my brother, as it has been years since we’ve had them. I planned to wrap them and put them under the tree for him but I was too excited and gave them to him within an hour of me bringing them home! The look on my brother’s face as he opened them and realized they were “Mémère’s Cookies” was absolutely priceless and was truly the best Christmas gift. Needless to say, it was a cookie filled holiday and that batch didn’t last long! Line a baking sheet with parchment paper – set aside. 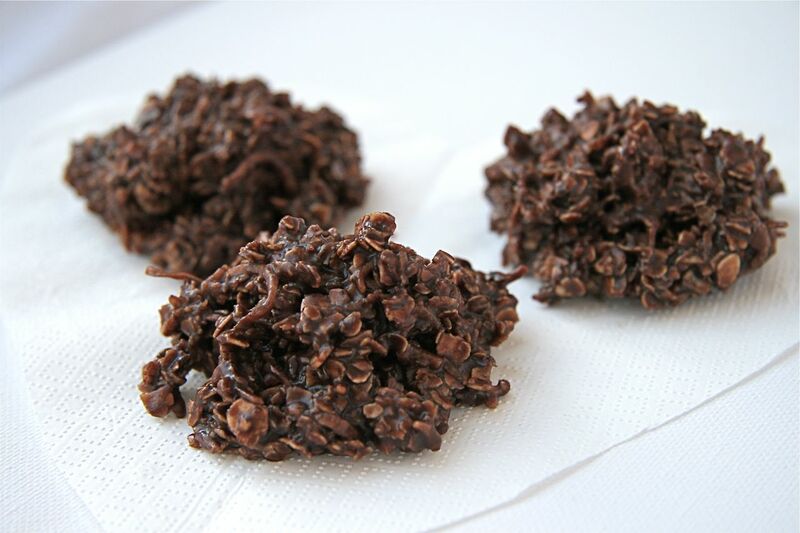 Combine rolled oats, cocoa powder and shredded coconut in a large glass or metal bowl. Set aside. Place sugar, margarine, milk and vanilla in a large saucepan (although the liquid mixture doesn’t look like a lot, you need room for it to expand when it comes to a boil). Bring the mixture to a boil over medium-low heat and once the mixture reaches a rolling boil, set timer for 2 minutes. Do not stir or swirl the mixture while it boils, just leave it be! Once the two minutes have elapsed, immediately remove the mixture from the heat and combine with the dry oats mixture in the glass (or metal) bowl. Stir well with a wooden spoon to combine all ingredients. While mixture is still warm, drop spoonfuls of the batter onto the parchment lined baking sheets (whatever size cookie you like – I usually do a very generous tablespoon). Place baking sheets in a cool place and allow the cookies to set. Once set, remove from the cookie sheet and enjoy! Store the cookies in an airtight container, either in the fridge or the freezer (our family keeps them in the freezer and we eat them directly from there! If you layer the cookies in the container, be sure to put some parchment paper between the layers so they don’t stick together). Note – the cookies are sticky and will be hard to drop onto the cookie sheet. The cookies are supposed to look a little messy, definitely not perfect circles, so don’t worry too much about it, and go ahead and use your fingers! Also, if you don’t allow the mixture to boil for 2 minutes, they will be too soft and won’t set. If you boil too long, they will become too hard and crumbly once set. So definitely pay attention to the mixture while it boils – that way, after 2 minutes you should have perfectly moist and chewy cookies! It is definitely about timing with these cookies and I remember my Mémère getting frustrated at times with the cookies being too soft or too hard – so unfortunately you may have to play with the timing a bit as stoves and your pots may affect the cooking time! * Dunne’ also asked for this to be a Valentine’s Day appropriate item. If they last until dessert time on the day you make them, I think they make a delicious dessert with a dollop of whipped cream and some sliced strawberries on top. What matters the most is that they are made with love!